You can set up a peer-to-peer (Quick Connection Mode) connection. This connects your computer directly to the projector with a wireless connection. While using this type of connection, you cannot connect your computer to the Internet, so make sure the EasyMP Network Projection software is already installed on your computer and your presentation or images are also stored on your computer. 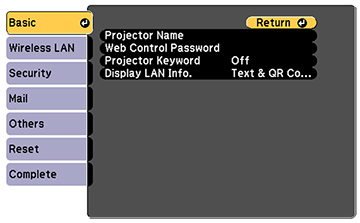 To set up the projector for a peer-to-peer (Quick Connection Mode) connection, see "Setting Up the Projector" below. To connect to the projector, see "Connecting Your Computer to the Projector" below. Note: Your computer must have a wireless card or built-in wireless interface and be running Windows 8.x, Windows 7.x, Windows Vista, Windows XP Professional x64, Windows XP, or OS X 10.5.8 to 10.10.x. Connect the Wireless LAN module to the projector's USB-A port. Note: The wireless LAN module is not included with the projector. You can purchase the Wireless LAN Module (part number V12H731P02) from the Epson Store. Press the Menu button on the remote control, select the Network menu, then press . 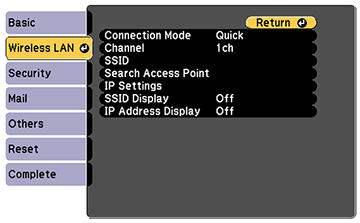 Select Network Configuration, then press . 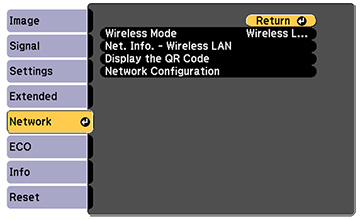 Select the Wireless LAN menu, then press . Set the Connection Mode setting to Quick. Select the Basic menu, then press . Select Projector Name, then press . Enter a name you can easily identify, then select Finish. The Projector Name is the name you'll select later to connect to your projector. Select the Security menu, then press . Set the Security setting to Open. Select the Complete menu, then press . Select Yes, then press . Press Esc to exit the menus. Install the EasyMP Network Projection software on the computer you will project from. To download and install the software, go to the EasyMP Network Projection software page ( Windows or OS X ), select Download under EasyMP Network Projection, then follow the on-screen instructions. 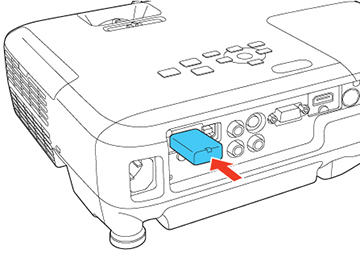 If necessary, connect the wireless LAN module to the projector's USB-A port. In your computer's list of wireless networks, select your projector's name. This is the Projector Name you entered in the projector's Basic menu. Note: You may not be able to connect to the projector while some menus are displayed. Press Esc to exit menus, if necessary. Start the EasyMP Network Projection software. Select Quick Connection Mode, then click OK. Select your projector, then click Connect. Your computer and projector are now connected.